tip their blowgun darts when hunting, hence the species’ name. These brightly colored amphibians are among the largest of the more than 100 poison dart frog species, averaging more than one inch (two and a half centimeters) in length. They live within a tiny plot of rain forest on the Pacific coast of Colombia. And though the population in its small range is abundant, widespread decimation of the rain forest has landed this species on international endangered lists. Their coloring, which can be yellow, orange, or pale green, depending on their particular range, is deliberately ostentatious to ward off potential predators, a tactic called aposematic coloration. Their diet includes flies, crickets, ants, termites, and beetles. 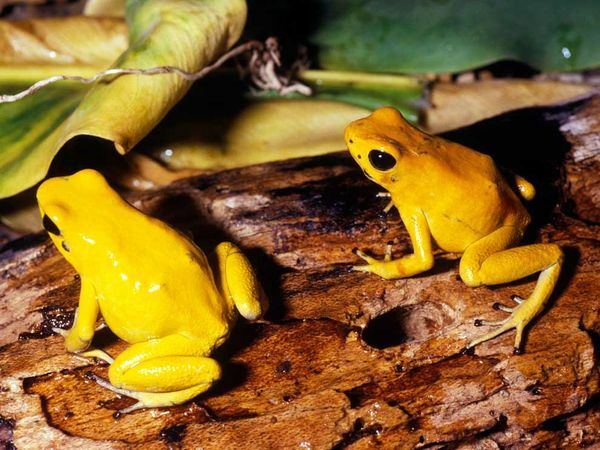 The medical research community has been exploring possible medicinal uses for the golden poison dart frog’s venom. They have already developed a synthetic version of one of the venom’s compounds that has promise as a powerful painkiller.